The battle of two ramen shops. 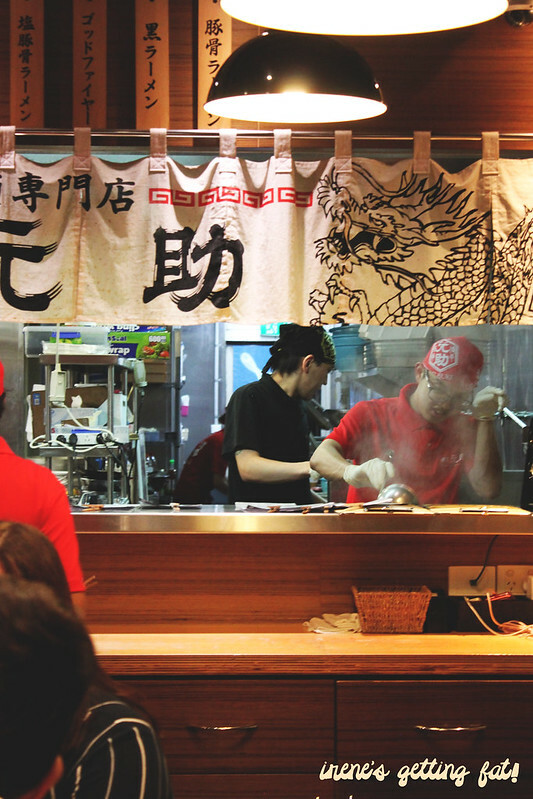 One doing Hakata style ramen, the other specializing in tsukemen and Japanese tapas. Let's start with Hakata Gensuke. This one was not even on our list, but the constant long queue drew us in. What is it with us and queues?It was almost like there's a guarantee that the food would be good with queues that long. It took us almost 45 minutes to get in on a Saturday at 3pm. 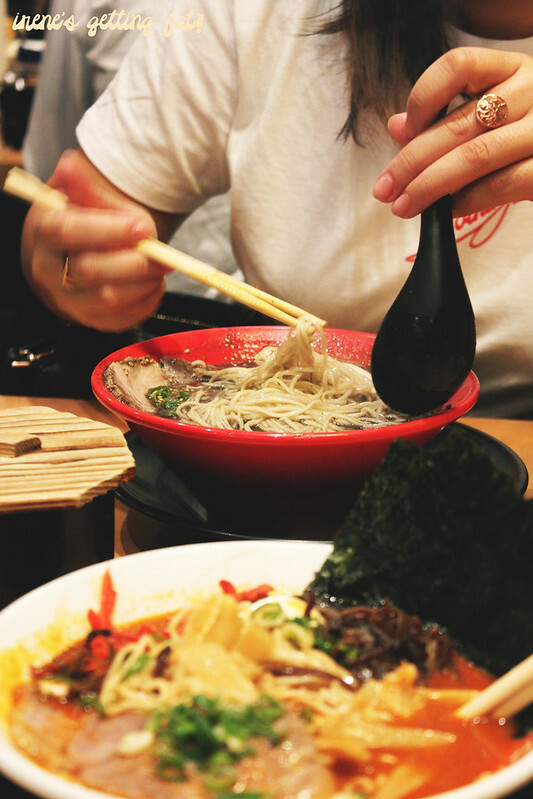 We already filled a menu before going in - ticking off our preference in noodles firmness, extra topping, and so on. The interior reminded me of Japan very much, bring red colours and typical ramen house decorations, and there was always steam wafting from the open kitchen. I went gangster and chose the Godfire with level 3 on spiciness (despite the waitress' warning). Wrong decision. 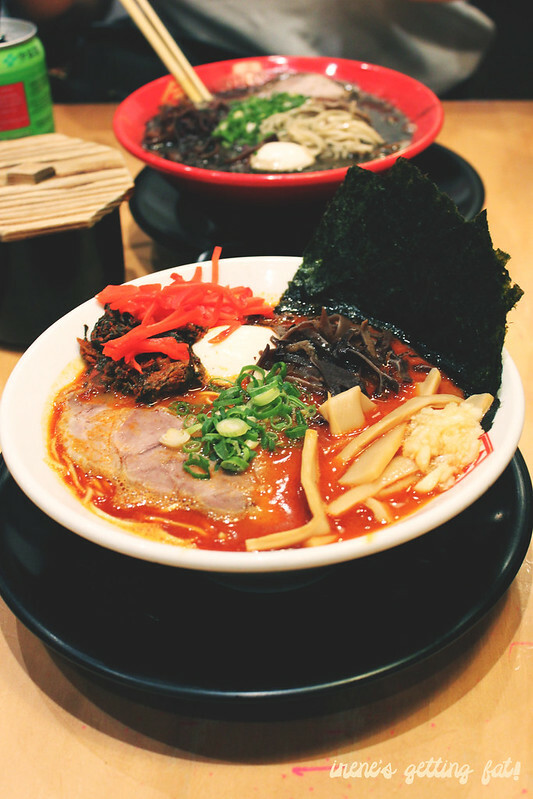 Godfire - Hakata ramen with tonkotsu broth and secret blend of Spicy Fire topped with chashu, black fungus, and spring onion ($15). Oh don't get me wrong, the ramen bowl was excellent. Firm straight noodles with aromatic, flavourful tonkotsu broth, topped with slices of chashu, soft boiled egg, spring onion, crunchy black fungus, and nori. It was the "secret blend of Spicy Fire" that I underestimated. I ended up finishing my bowl but oh boy did I suffer the consequences from the chilli. 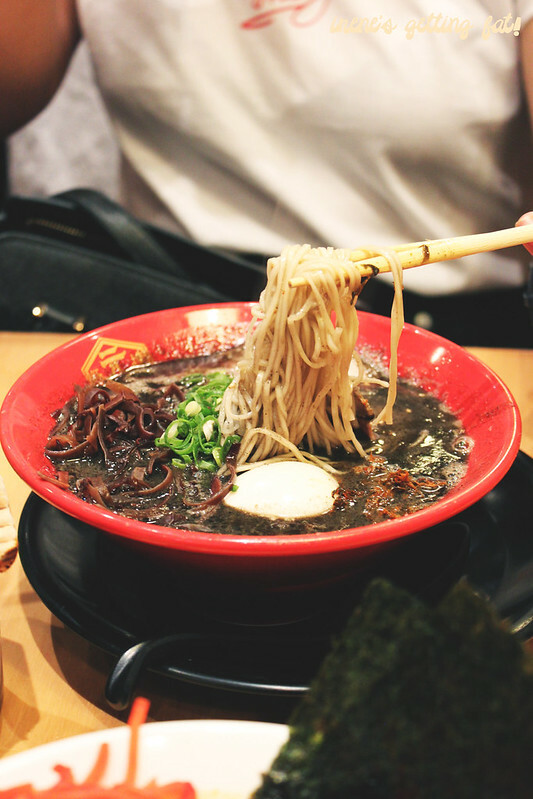 Amy was wiser and chose the tamer Black Tonkotsu whose tonkotsu broth had been spiked with special fried garlic and black sesame paste. It had such great depth of flavour and although it did not have that kick my Godfire had, the garlic and black sesame made it very exciting to eat. Black Tonkotsu - tonkotsu broth with special fried garlic and black sesame paste topped with thin noodles, chashu, black fungus, and spring onion ($15). And then we have Mensousai Mugen. This modern space was absolutely different than Hakata Gensuke. 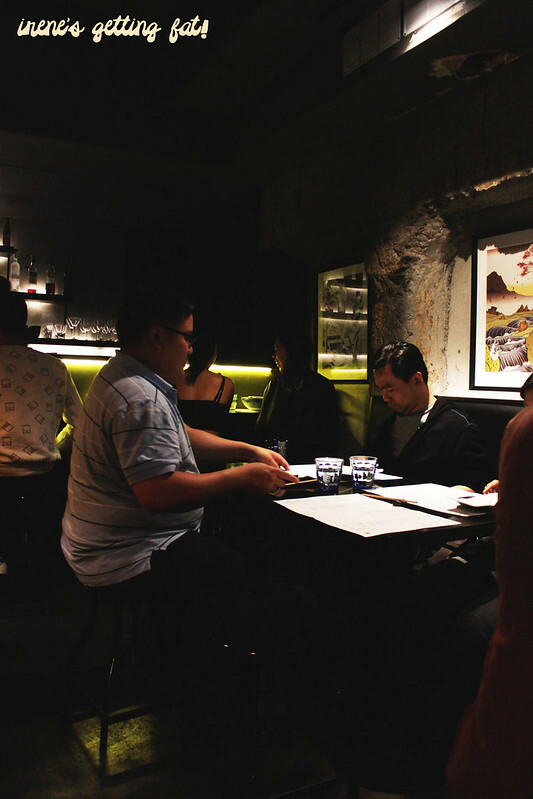 The interior of their basement ramen bar was sleek, sophisticated, and dimmed lighted. They serve an array of beer, wine, and even sake, and they specializes in tsukemen (ramen with dipping broth) and 'Japas' or Japanese tapas. Each table has a sheet of manga explaining how to enjoy tsukemen which is a nice, cheeky touch. 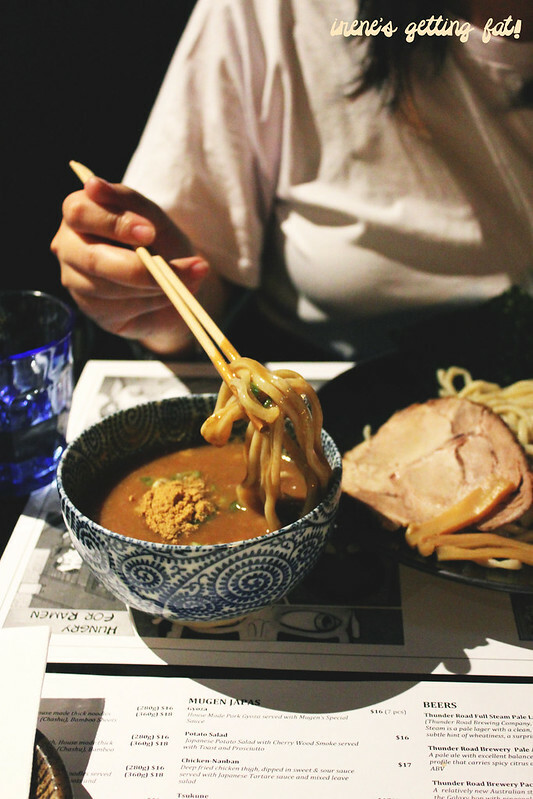 We shared a bowl of Goma Tsukemen because we had eaten non stop that day and our jeans were getting pretty tight. The sesame soy sauce broth was dense, savoury, and cling onto the thick noodles like sauce. The broth was somewhat addictive and paired really well with the chewy noodles, chashu, bamboo shoot and soft boiled egg. Goma tsukemen - sesame soy sauce broth, homemade thick noodles with chashu, bamboo shoots, seaweed and soft boiled egg ($16/$18). 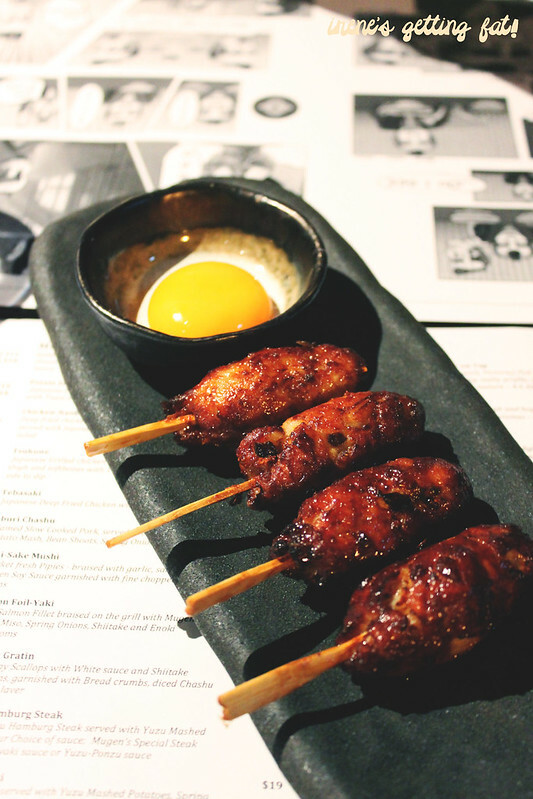 We also tried the tsukune, which were grilled chicken skewers with teriyaki sauce and served with an egg yolk to dip it to. I did find it slightly weird with the egg yolk, but the chicken itself was very succulent, juicy, and had great flavours. Japanese grilled chicken skewers made from tenderloin thigh and softbones with teriyaki sauce and egg yolk ($17). 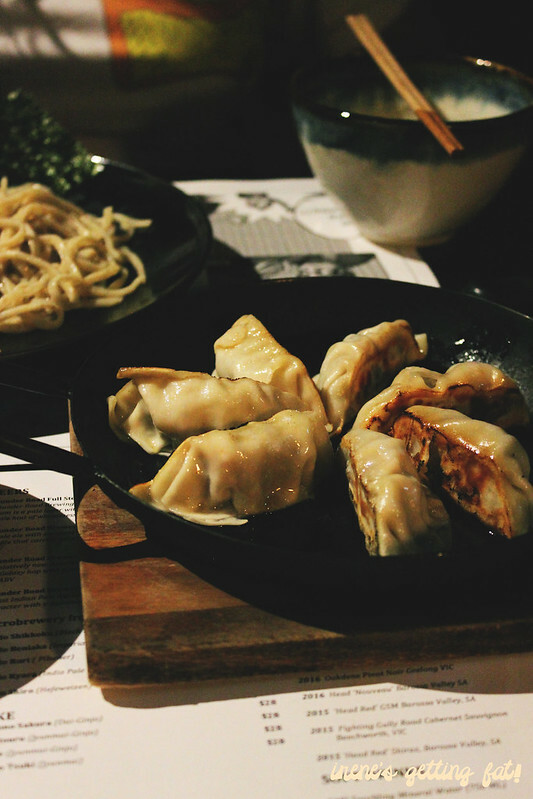 The gyoza was also really nice, although it did not arrive hot to our table. It was juicy inside with thin skin and lovely 'Mugen special sauce'. Which one is better you ask? 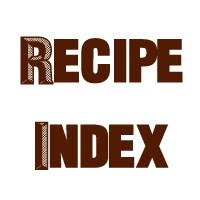 Well, they specializes in different kind of ramen so it is almost unfair to compare. But we did agree that we like the lively ambiance and the Hakata ramen more from Hakata Gensuke. I guess the queue did prove a point. 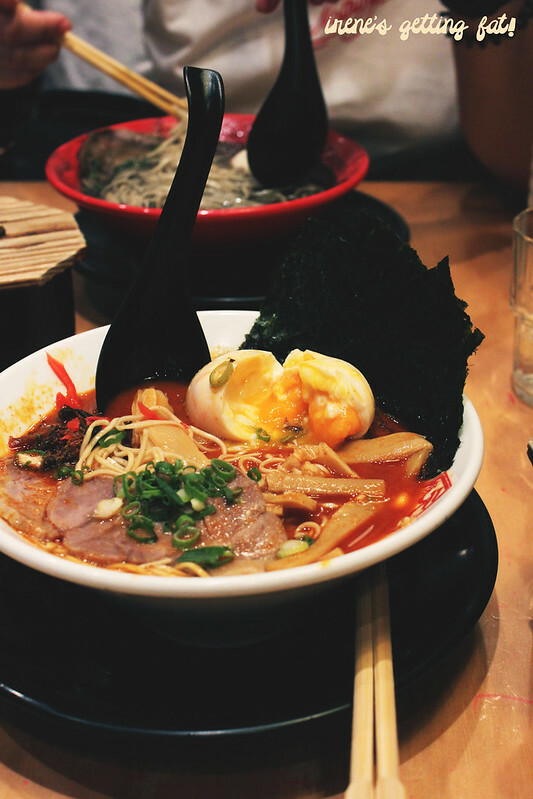 Different ramen shops with their own unique menus and atmosphere; definitely check them out! 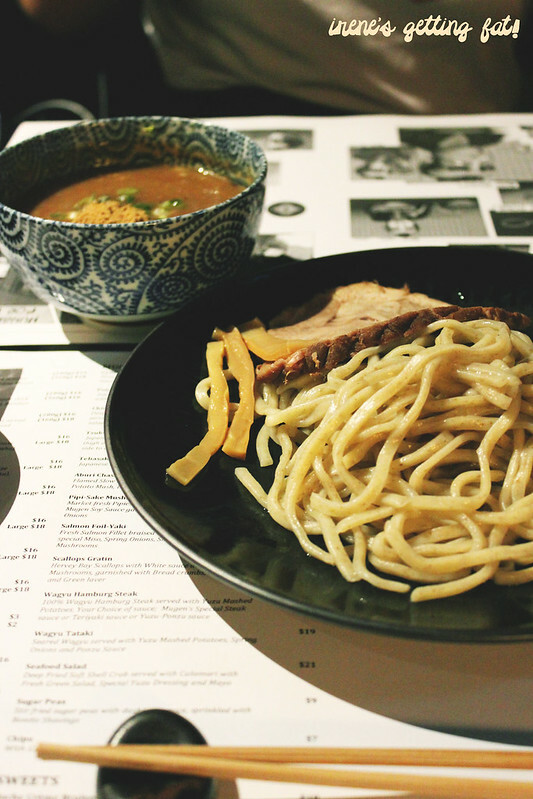 Yeah very hard to compare coz one indeed specialises in Hakata ramen and the other Tsukemen commonly seen in Tokyo. I’m yet to try Mugen! True! And you should totally check Mugen out, their thick noods are so good! These guys saved me from a lot of trouble. Thankfully they are quick, discreet & very reasonable. Is there anything you want to edit in your statement? Get these guys to help you with all your needs. 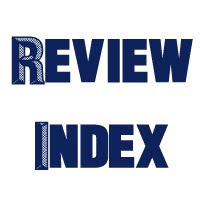 Do you know you can lose fat with fat burners Irene? Do get obese okay! you need any help with your bank statement, you can contact them for detials. They were so accommodating and I was truly impressed. It is such a comfortable environment. For a buffet, it was delicious food. Alcoholic beverages were also great. Overall, these San Francisco venues are great, and my favorite venue in the city.